While hanging up the Christmas ornaments, the kids and I discovered a snowman ornament David made in 2nd grade. It is a snowman made out of a bobby sock. David shows it off like it is the best thing ever. Caleb quietly decides on his own that he will not be outdone. Without any help or knowledge on my part, Caleb goes to the kitchen and begins his snowman sock ornament. 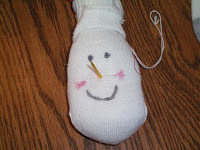 I kid you not, he takes off his dirty sock from his foot, rummages around the art supplies and finds 2 google eyes. He finds the glue to glue them on. He pushes a chair to the sink to get the toothpick for the nose that is out of reach. He finds one and shoves it in the sock for the snowman's nose. He then gets out the markers and draws in the rosy cheeks and the snowman smile. He continues to find ribbon to tie a knot around the top to allow it to hang as an ornament should. He runs into the living room to show off his snowman ornament. I am giggling inside because of the independence of his craft, the thought that he too should have one on the tree, and the rivalry that this event represents. We proudly hang it on the tree. 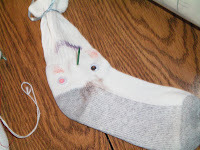 So for years to come, if you visit at Christmas, be sure to look for our dirty sock ornament.